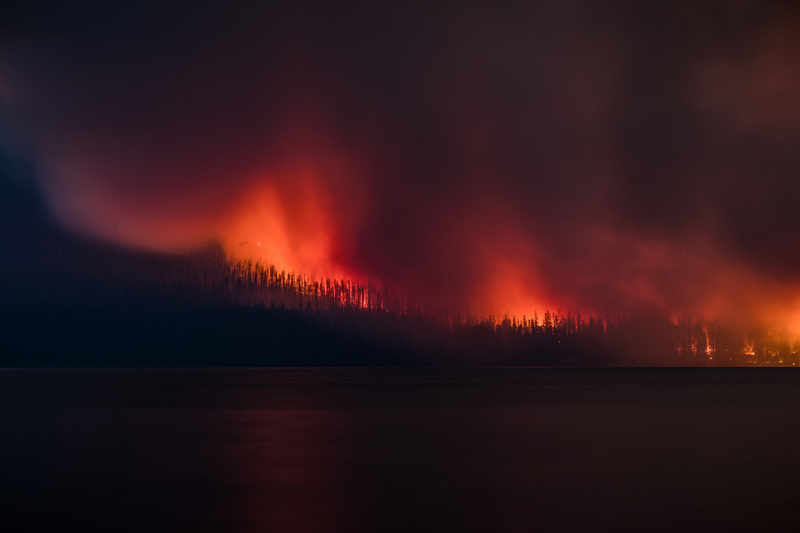 On the night of August 11th, 2018, lightning three fires started in Glacier National Park. This image is of the Howe Ridge Fire that started in an area that burned in the 2003 Roberts Fire near Stanton Mountain. By mid-day on August 12th several CL-215 (Canadian âsuperscooperâ) airplanes flew for four hours, dropping thousands of gallons water from Lake McDonald onto the Howe Ridge Fire, however this was not effective in stopping fire growth and the planes were redirected to other fires outside of the park. Firefighters attempted to hike to the fire, but were not immediately able to engage the fire due safety concerns. By the end of the day staff had evacuated several areas of the park and closed roads and trails near the fire. Photo by Glacier NPS.